For a team on the tail end of such a dismal season, the Chicago Blackhawks treated fans to some fun and entertaining hockey last week. There was a little bit of everything. The team fell 4-3 Monday to the San Jose Sharks, but it was a spirited affair that went all the way to a shootout. Then there was the 6-2 victory over the Winnipeg Jets on Thursday. The big story here was the accountant-turned-NHL-goalie who stopped seven of seven shots as an emergency backup. But it was also Brent Seabrook’s 1,000th NHL game, and the solid debut of top prospect Dylan Sikura. The Hawks came down to earth a bit with a 5-0 loss to the Colorado Avalanche Friday night. Ah, such is life for the Blackhawks. All in all, there are some good things to talk about. Let’s get to it. Poor Seabrook has really gotten the shaft this past year. He hasn’t had the best season, and his albatross contract has the fans calling for his head, or at least for him to be traded. But what gets forgotten is that Seabrook’s been with this team through thick and thin. He was drafted by the Blackhawks in 2003 and has been with the team since the 2005-06 season. That’s 13 long seasons. Seabs started his career in the dark days of the franchise, has since seen them through the glory of three Stanley Cups, and is poised and ready for what comes next in the only world he’s ever known. He’s the backbone of the team as an alternate captain and beloved and vocal teammate. He was recognized for all these things and more Thursday night at the United Center as he suited up for his 1,000th NHL game. It was a fitting tribute. It’s been exciting and uplifting to see the younger players thrive with more minutes and bigger roles as the team looks towards the future. This past week, we witnessed the debut of four more such players. Ejdsell came first, starting versus the Sharks Monday night. He was acquired as part of the Ryan Hartman trade to the Predators. Ejdsell was lucky in his first outing, lining up to center Brandon Saad and Patrick Kane on the Hawks’ top line. The 6-foot-5, 22-year-old made a solid debut. He finished the night with three shots on goal, two hits, and won 6-of-11 faceoffs (55 percent). On Thursday against the Jets, Ejdsell earned his first NHL assist on an Alex DeBrincat goal (who’s now tied with Patrick Kane for the team lead with 27 goals). Ejdsell played the last two games with DeBrincat and fellow newbie Dylan Sikura. DeBrincat, a rookie himself, is amusingly the veteran on this line. He’s committed to taking the other two under his wing, both on and off the ice. It’ll be fun to see what this trio can do in the last three games of the season. Cue the man we’ve all been waiting for, the Hawks’ top prospect. Sikura signed a two-year deal with the Hawks on March 25 after finishing his final year with Northeastern University. He joined the team for his first game on Thursday against the Jets, tallying two assists and four shots on goal. Sikura brings speed and skill and a nose for the net. He’s excited to see how his collegiate success will translate to the NHL level. Per Mark Lazerus of the Chicago Sun-Times, he described the play that led to his secondary assist on an Erik Gustafsson goal. Delia was supposed to make his NHL debut between the pipes Friday against Colorado, but it came a day early instead. Anton Forsberg hurt himself during warmups before the Jets game, so Delia was called into action. He performed well, stopping 25 of 27 shots for a .926 save percentage before exiting the game in the third period due to cramps. His performance against the Avs wasn’t so hot (giving up five goals on 36 shots for a .861 save percentage), but it appears he’ll have a chance to redeem himself. It was announced last Friday that Forsberg is out for the rest of the season. Hillman was the final prospect to make his first NHL appearance this past Friday against the Colorado Avalanche. 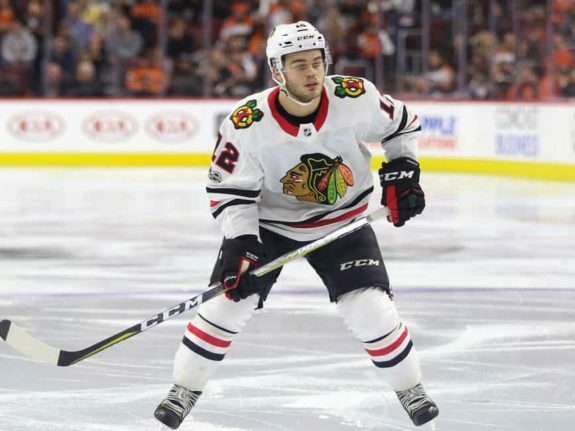 It’s fitting that Hillman made his debut in Denver, as he’s a defenseman that played for the University of Denver until he signed with the Hawks on March 27. This wasn’t a good game for any of the Blackhawks, but Hillman did manage one shot on goal, three hits, and three blocked shots in a respectable 19:18 minutes of playing time. He lined up mostly on the third defensive pairing next to Jordan Oesterle. You can’t script it better than this. As mentioned earlier, Forsberg was injured before the Jets game, and then Delia exited with cramps in the third period. The Hawks had no choice but to utilize their emergency backup goaltender. As it turns out, people such as Scott Foster are kept on hand for just these kinds of situations. The reason none of us know this is because these situations almost never happen. Foster is a 36-year-old accountant by day and plays goalie for a recreational league out of the Blackhawks’ practice facility, Johnny’s Ice House. He claims he’s been on hand for emergency purposes at the United Center a little over a dozen times, just in case. But he never expected to actually suit up. Well, on Thursday night it came to fruition. Foster took the net for the last 14 minutes of play and stopped all seven shots he faced. Afterward, he was named the first star of the game and got to ham it up with the media. What a story to tell the grandkids! Forgive me for fudging it a bit here. The long-time wedding analogy was too good to pass up for this piece. I’d say everyone was quite “blue” when the Hawks were shut out by the Avs 5-0 Friday night. What a letdown after two positive games! And it just had to be Colorado. The same team that ruined the streak in 2013. But let’s take a look ahead and pull another division rival into the fray. The Hawks wrap up their season this coming week with three more games. Two of those tilts are against the St. Louis Blues, on Wednesday and Friday. Through the weekend’s games, the Blues sit one point back of the Avalanche for the final wild-card spot in the Western Conference, but they have a game in hand. With four games left in their regular season, every point counts if they want to see the postseason. Beating the Blackhawks could easily be their ticket to a playoff berth. Losing to them could spell the end. The Hawks should embrace their spoiler role for these two contests. Finally, the Hawks take on the Jets for their final game of the season this Saturday. I’ll bet the Jets will be motivated for some revenge after losing 6-2 to the Hawks last week. Can the Blackhawks end on a high note? What will the kids accomplish in these last games? Will it be Kane or DeBrincat with the most goals? Stay tuned for the last dance this coming week!